In late September the New York State Attorney General ordered the Trump Foundation to stop accepting donations because it failed to file audits with the State of New York. The foundation had raised $25,000 from outside donors. 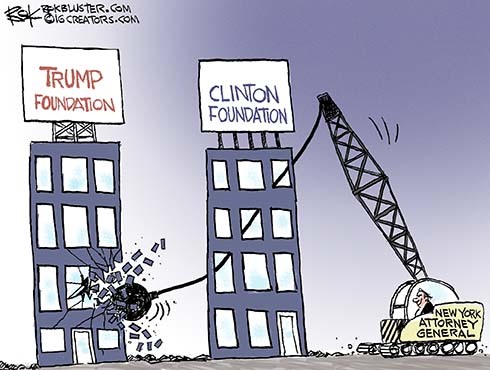 Ostensibly a charity, the foundation was a de facto fraud scheme to monetize Hillary’s power as secretary of state (among other aspects of the Clintons’ political influence). The scheme involved (a) the exchange of political favors, access, and influence for millions of dollars in donations; (b) the circumvention of campaign-finance laws that prohibit political donations by foreign sources; (c) a vehicle for Mrs. Clinton to shield her State Department e-mail communications from public and congressional scrutiny while she and her husband exploited the fundraising potential of her position; and (d) a means for Clinton insiders to receive private-sector compensation and explore lucrative employment opportunities while drawing taxpayer-funded government salaries. While the foundation did perform some charitable work, this camouflaged the fact that contributions were substantially diverted to pay lavish salaries and underwrite luxury travel for Clinton insiders. Contributions skyrocketed to $126 million in 2009, the year Mrs. Clinton arrived at Foggy Bottom. Breathtaking sums were “donated” by high-rollers and foreign governments that had crucial business before the State Department. Along with those staggering donations came a spike in speaking opportunities and fees for Bill Clinton. Of course, disproportionate payments and gifts to a spouse are common ways of bribing public officials — which is why, for example, high-ranking government officeholders must reveal their spouses’ income and other asset information on their financial-disclosure forms. McCarthy is a former assistant U.S. attorney for the Southern District of New York. He prosecuted the Blind Sheik in connection with the 1993 World Trade Center bombing. That was before the FBI showed Huma Abedin an email the president had sent to Hillary – using a pseudonym. “Why is this not classified?” exclaimed Huma. 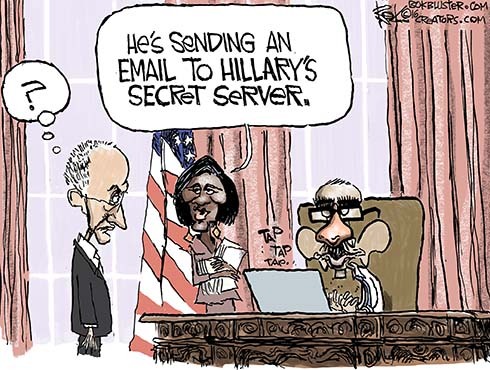 Did Obama share classified information on Hillary’s unsecured secret server? Maybe the Russians will let us know. Fox’s Judge Napolitano and National Review’s Andrew McCarthy (a former federal prosecutor) speculate that the FBI went easy on Hillary because Obama would have been a defense witness in her case. Update 10/31/16: Former Attorney General Michael Mukasey joined the all about Obama theme writing in today’s WSJ, “If Mrs. Clintgon was at criminal risk for communicating on her nonsecure system, so was he.” “He” being the president. Rather than convene a grand jury to subpoena her computer, the FBI gave Cheryl Mills immunity from prosecution. Mills served as Hillary’s chief of staff and as her attorney. The FBI also gave immunity to four others and agreed to destroy computers after reviewing evidence on them. 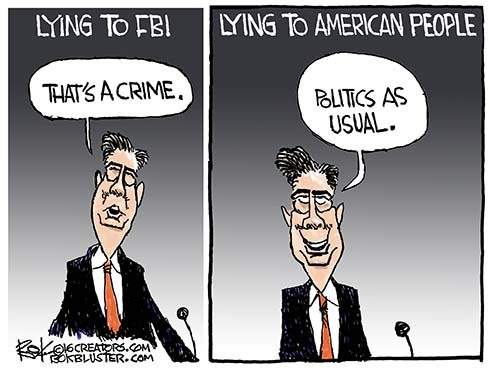 Had anyone else in government set up a private e-mail server, sent and received classified information on it, deleted over 30,000 e-mails, ordered subordinates to circumvent court and congressional orders to produce documents, and serially and publicly lied to the American people about the scandal, that person would surely be in jail. 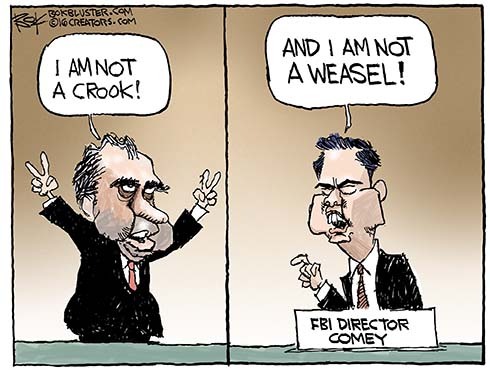 Not that anyone asked, but Director Comey assured us the FBI is not overrun by weasels. Members of Congress needed assurances after last Friday’s FBI document dump. The dumped documents revealed that Clinton consiglieri Cheryl Mills sat in on Hillary Clinton’s FBI interview. Mills listened along with eight other lawyers while Hillary was questioned about her private email server. Mills is also a witness in that case. Legal experts say that’s unusual because it gives attorney/client protection to her communications with Hillary. 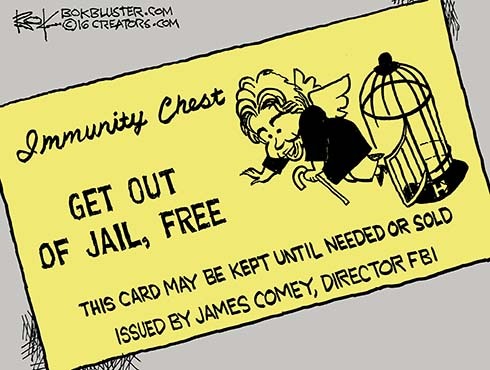 And the Justice Department gave her immunity anyway. Committee Chair Trey Gowdy, a respected former federal prosecutor himself, says this isn’t the FBI he remembers. Comey sputtered that it is so. Hillary Clinton didn’t testify under oath in her three and a half hour interview with the FBI. Director Comey said there was no evidence she was lying. There was no transcript either. On Monday a federal judge delayed ruling on a deposition of Hillary. The deposition was requested by Judicial Watch as part of its lawsuit against the State Department over her private email server.